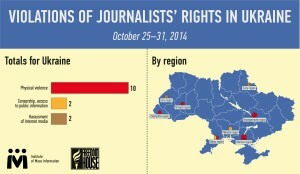 In Ukraine between 25 and 31 October 10 cases of violations of journalists’ rights were registered in the categories «Physical agression», four of them in Kherson oblast. Two cases were in the categories «Censorship. Access to public information» and «Internet pressure» each. Category «Physical aggression» District electoral commission No.37 (Dnipropetrovsk oblast, Kryvyi Rih rayon) held a meeting of the commission not allowing journalists and observers to attend. Besides, Oleh Shcherbak, a journalist of the newspaper «Tochky opory», who came to the meeting with mobile team of observers from public network «OPORA», did not get the access to it. At electoral district No.24 (Dnipropetrovsk) a camera crew of Channel 11 was prevented from shooting during the elections twice. In Odesa the camera crew of Channel 7 was not allowed to enter the polling station No.511336 of the electoral district No.135 in Prymorskyi rayon which is located in the premises of a military hospital. Besides, journalists of Dumskaya and Reporter failed to get into this polling station. In Ternopil the district electoral commission arrived at decision to deprive Ihor Protsyk, a correspondent of the newspaper «Tochka zoru», of his right to be present at polling station No.611096 of the electoral district No.163. At precinct electoral commission No.210267 (village of Repinne, Mizhhirskyi rayon, Zakarpattia oblast) members of a commission threatened Nadiya Vats, a journalist of all-Ukrainian public publication «Tochka opory», who fixed the violation of electoral legislation by the commission. In Kherson the authorised person of Yuriy Odarchenko, a Parliamentary candidate of electoral district No.182, demanded that the journalist from «Spilno TV» stop broadcasting a voting process. At electoral district No.182 a man in camouflage prevented a journalist Oleksandr Karpenko from photographing. In school No.27 (district No.182, polling station No.743) an electoral commission refused to register journalists from local mass media. Sitting MP Yuriy Odarchenko restrained Yevheniy Rudenko, a journalist of the media outlet «Khersonski visti», from moving during the meeting of district electoral commission No.182. 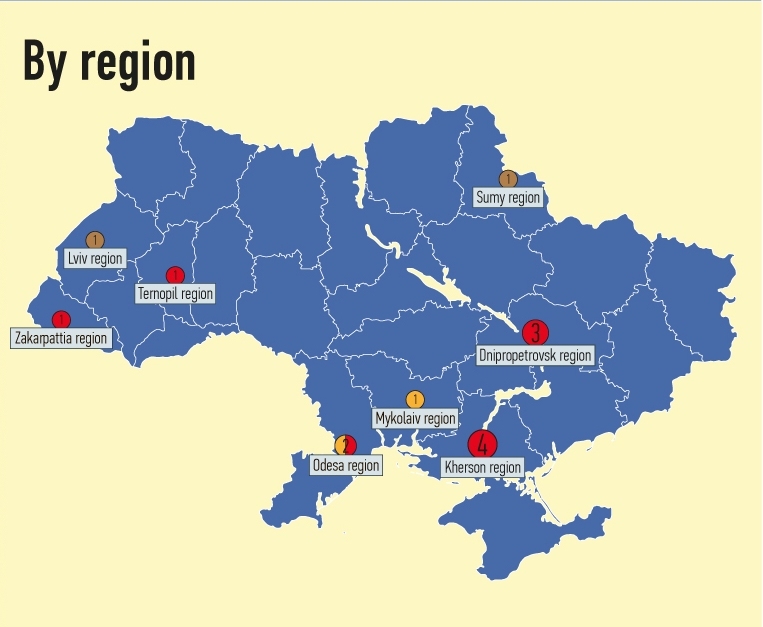 In Lviv the website of Religious Information Service of Ukraine (RISU) was attacked by a group of hackers «CyberBerkut». The director of TV and radio company “Vezha” (the city of Konotop, Sumy oblast) claimed that on the election day there was an external interference with a TV company server. As a result an interview with Parliamentary candidate was on air. In Odesa at electoral district No.135 (Prymorskyi rayon of Odesa) the electoral commission divided the places for observers from those for journalists with a red tape. Moreover those places for journalists and observers were far from the commission table. In the Ministry of Internal Affairs Andriy Lokhmatin, a correspondent of Mykolaiv online media outlet «Presupnosti.NET», received a denial to get a copy of minister Arsen Avakov’s order to confer a decoration «Firearm» on some persons.